Italian media have published classified sections of an official US military inquiry into the accidental killing of an Italian agent in Baghdad. The 40-page report was censored by the Pentagon before being officially published on Saturday. Italy has refused to accept the US report's findings and is to publish its own version of events later this week. 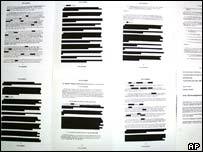 Details of the official report were published in newspapers on Sunday with censored material restored in full. A Greek medical student at Bologna University who was surfing the web early on Sunday found that with two simple clicks of his computer mouse he could restore censored portions of the report. He passed the details to Italian newspapers which immediately put out the full text on their own websites. The missing text contains the names and ranks of all of the American military personnel involved in the killing of Nicola Calipari, the Italian agent who was given a state funeral and awarded Italy's highest medal of valour. It also reveals the rules of engagement in operation at the military checkpoint near Baghdad airport which have been contested by the Italian authorities. The censored sections include recommendations that the American military modify their checkpoint procedures to give better and clearer warning signs to approaching vehicles. The official Italian report on the incident expected to be published this week will accuse the American military of tampering with evidence at the scene of the shooting. The Americans invited two Italians to join in their inquiry, but the Italian representatives protested at what they claimed was lack of objectivity in presenting the evidence and returned to Rome. Relations between Rome and Washington remain tense.